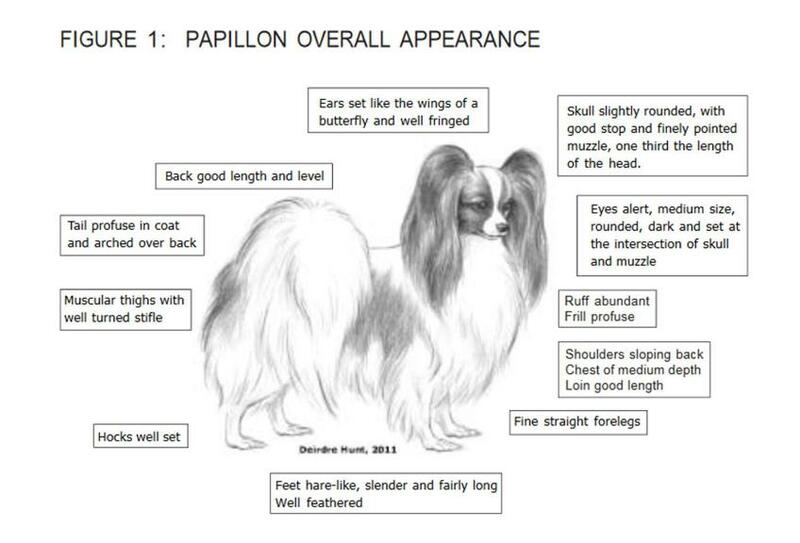 Australian Papillon standard in picture format. Copyrighted to the Papillon Dog Club of NSW Inc & The Papillon Club of Victoria Inc.
Parti-colour - white with patches of any colour. Tri-colour - black and white with tan spots over eyes, inside the ears, on cheeks, and may have tan under root of tail. On the head, colour other than white must cover both ears, back and front, and extend without interruption from the ears over both eyes. A clearly defined white blaze and nose band are preferred to a solidly marked head. Symmetry of facial markings is desirable. The size, shape, placement, or absence of patches on the body are without importance. Papillons may be any parti-colour, provided nose, eye rims and lips are well-pigmented black. Among the colours there is no preference. Ears small, pointed, set too high, one ear up, or ears partly down, set too low. In general terms, the Papillon Breed is considered a healthy toy breed, frequently living until age 13 to 17 years of age. Papillons are very intelligent, athletic, and friendly. Maintaining good oral hygiene is important for the Papillon. The Papillon has a small jaw bone with small teeth and root structure. Loss of teeth occurs most frequently from gingivitis, inflammation of the gums with subsequent loosening of the tooth in the gums and jaw bone. Gingivitis caused toy dogs such as Papillons with small jaw bones to lose teeth faster than larger breed dogs. Brushing the teeth regularly along with scaling teeth of tartar buildup will help prevent gingivitis and tooth loss in the Papillon. Professional dental care is needed on a regular basis for many Papillons to prevent loss of dentition. Providing appropriate dog chew items can assist in reduction of tartar. There is also evidence that an unhealthy, infected mouth can lead to other health problems in the Papillon. This is a condition rarely seen but it is a genetic condition in Papillons that causes blindness sometime between 4 and 8 years of age. Both parents must be genetic carriers to produce a puppy with PRA. The Papillon Club of America is currently participating in an AKC –CHF Research Study with Dr. Simon Petersen-Jones, Principal Investigator at Michigan State University Veterinary School. The goal of this Research is to find a genetic marker for the disease and develop a test for PRA in Papillons. The Papillon Club of America Health and Genetics committee also recommend that dogs used in breeding programs have regular CERF eye exams until ten years of age. These exams need to be performed by Veterinary Ophthalmologists and be registered with CERF ( Canine Eye Registration Foundation). These disorders include Liver Shunts, both Internal and External shunts and Micro Vascular Hepatic Dysplasia. These problems are not seen frequently in Papillons but they do occur occasionally and from anecdotal evidence appear to come from kindred Papillons. The evidence indicates that dogs with liver shunt disorders and hepatic microvascular dysplasia are genetic problems. The Papillon Club of America is currently participating in an AKC-CHF Research Study with Dr. Sharon Center, Principal Investigator at Cornell University Veterinary School, Ithaca New York to study this problem in Papillons. We hope to avert any major problem that may develop in the breed regarding inherited liver disorders. This condition can be genetic problem; it may be passed on by one or both parents. There is some evidence that it can be caused by environmental toxins as well. This occurs in male Papillons: the testicles fail to descend into the scrotum. The testicles of the male puppy should be in the scrotum by twelve weeks of age. If one or both testicles are missing, they are either Monorchid or Cryptorchid. There is an increased risk of testicular cancer if one or both testicles are retained in the abdomen. Neutering the dog with this condition is in the best interests of the dog. The retained testicle must be surgically removed from the abdomen during the neuter procedure. Epilepsy is a brain disorder caused by abnormal brain waves that induce a seizure or fit. There are many causes of epilepsy that are from extra-cranial causes as well as intracranial causes. Idiopathic epilepsy is a diagnosis made when all other internal and external causes of a seizure disorder have been ruled out. Idiopathic Epilepsy is considered to be an inherited condition and is not frequently found in the Papillon breed. The majority of dogs that develop idiopathic epilepsy have their first seizure between the ages of one and two years of age, with some developing it later. It is recommended by Malcolm B Willis, PhD, author of Genetics of the Dog, that dogs with idiopathic epilepsy or their first degree relatives should not be used in a breeding program to reduce the risk of genetic transmission of the Idiopathic seizure disorder. This is by far the most frequent orthopedic problem found in the Papillon Breed. Patella luxation is thought to be a genetic condition that arises due to a shallow groove in the fibula that allows the ligament holding the patella in position to slip out of the groove and allow the Patella (kneecap) to slide out of position either medially or laterally. Patella luxation is graded from a one to four depending on the severity with grade one being the least severe. Symptoms of patella luxation may be lameness in one or both hind legs. The lameness can be intermittent or continuous and can frequently be treated with anti-inflammatory medications and exercise restriction. If the lameness is continuous and the joint is unstable, surgery can be an option to correct the problem. An OFA ( Orthopedic Foundation for Animals ) examination of the Patella done by a Veterinarian is one of the tests that Papillon Club of America Health and Genetics committee recommends for dogs that are used for breeding. The Papillon is a toy dog, when they leave to their new homes many do not weigh more than three pounds. Most responsible breeders will not let a puppy leave before it is 3 months of age. If a puppy plays hard and does not eat well, hypoglycemia (low blood sugar) can result. Symptoms of hypoglycemia are lack of energy, glassy eyes, weakness, tremors and in serious cases seizures. A simple case of hypoglycemia can be caused by too much exertion of energy and not having adequate food intake. Immediate treatment is necessary with NutriCal, Karo Syrup, Sugar water, Honey—anything that raises the blood sugar rapidly followed by a meal. Veterinary care is needed if the puppy fails to respond or eat a tasty meal. New owners should be advised to be certain that their active new Papillon puppy eats frequent small meals to meet their nutritional needs. Hypoglycemia can also be the result of severe infection or other events. Hypoglycemia should be treated immediately by a Veterinarian if illness or trauma is suspected. Puppies should not be allowed in public areas or in large populations of other dogs until they are adequately vaccinated. Dr. Ron Schultz of the University of Wisconsin is a world renowned expert in the field of Veterinary Immunology. Dr Schultz has written a number of articles regarding vaccines that provide a wealth of information on vaccines and the appropriate use of them. I would recommend people wishing to become informed on the wise use of vaccines use Google to find information on vaccines written by Dr. Ron Schultz. You will learn the appropriate use of immunizations from the articles he has published. The research done by Dr. Schultz has led to the current standards for canine immunization that are being taught in the Veterinary schools today. When a puppy comes to a new environment, “Puppy Proofing the Area” is a high priority. The Papillon puppy is a very curious, precocious youngster. Electrical cords, unprotected decks or stairs, unsupervised small children or other animals, small holes in fences, toxic plants or lawn products, exposed hooks that can catch a tiny mouth, tiny items or toys that can cause choking are hazards to the Papillon Puppy. Many puppies have been seriously injured or killed from preventable accidents in unsafe environments. It is fun to hold a small puppy in your lap while driving but remember that as fully grown people can be seriously injured by an airbag, Papillons can be crushed and killed by them. When traveling, it is wise to place your Papillon in a sturdy crate or buy an approved canine harness to secure the dog properly in an automobile. Also, be vigilant that your Papillon does not become a casualty of a motor vehicle wheel, keep you puppy on a leash when out of the enclosed yard. Train your dog to wait at the front door and/or place an additional barrier at the door to prevent dashing out to a dangerous street. Sometimes this is called hurffing and is frequently observed in both puppies and adults. It sounds like a gagging, cough combination. It is thought to be a spasm of the trachea. It may occur when the dog is excited, sometimes when on a walk, when playing or for other unexplained reasons. It sometimes can be arrested by offering a treat and getting the dog to swallow or stroking the throat gently. Blowing gently into the nostrils can sometimes be effective in arresting a case of reverse sneezing. Reverse sneezing should not be confused with tracheal malacia ( collapsing trachea ) or kennel cough. a member of the Papillon Club of America Health and Genetics committee. Elaine is a Papillon fancier, exhibitor, and occasional breeder. Health and Genetics Committee of the Papillon Club of America.